Raymond Daniel Manczarek, Jr., known as Ray Manzarek (February 12, 1939 – May 20, 2013), was an American musician, singer, producer, film director and author, best known as a founding member and keyboardist of “The Doors” from 1965 to 1973. He was a co-founding member of Nite City from 1977 to 1978, and of Manzarek–Krieger from 2001 to his death. From 1962 to 1965, he studied in the Department of Cinematography at the University of California, Los Angeles (UCLA), where he met film student Jim Morrison. At UCLA, he also met Dorothy Fujikawa, whom he married. They have a son, Pablo. Forty days after finishing film school, thinking they had gone their separate ways, Manzarek and Morrison met by chance on Venice Beach in California. 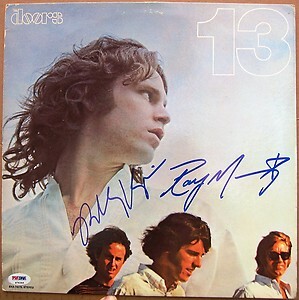 Morrison said he had written some songs, and Manzarek expressed an interest in hearing them, whereupon Morrison sang a rough version of “Moonlight Drive”. Manzarek liked the songs and co-founded the Doors with Morrison at that moment.